Not bad for a start, but the shading could be more refined, propeller cone more rounded and the contour of the bottom-rear fuselage as well as of the wing leading edge looks really bad, being somewhat wavy now. Plus the horizontal stabilizer is 4-pixel thick for most of the length then suddenly drops to just 1-pixel - make it 4-3-1 thick. 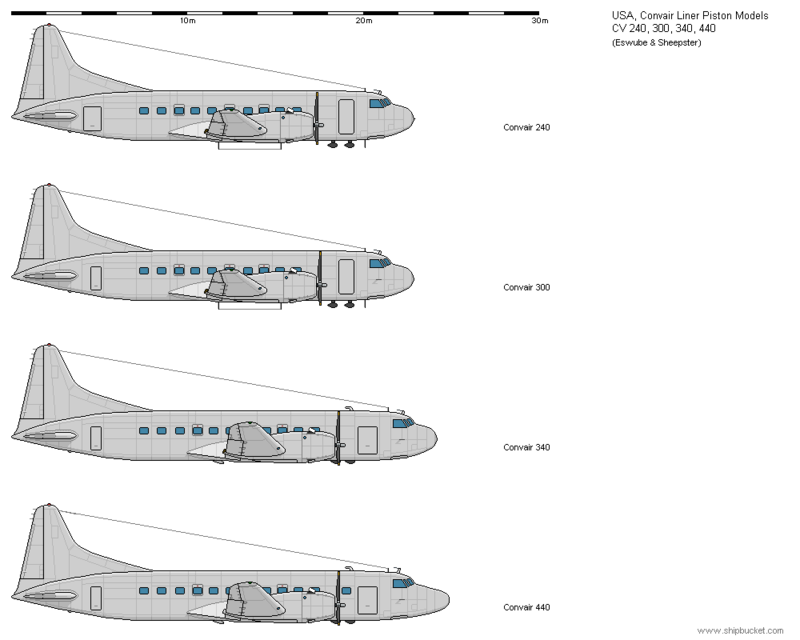 What started as an addition of the lesser known Convairs, became a reworking of the Convair base models - thanks Eswube. 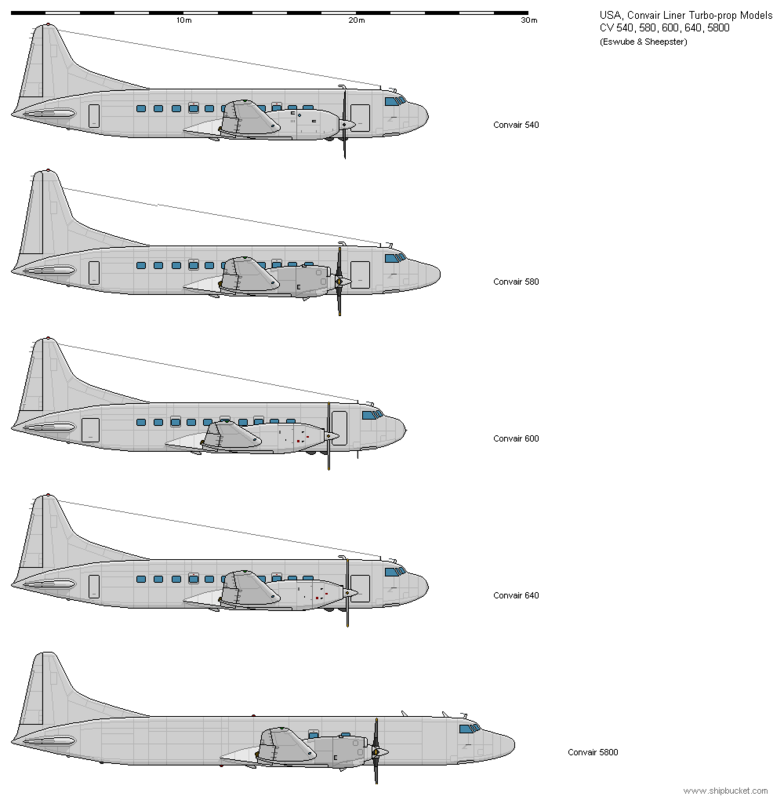 The initial Convair 240 (2 engines, 40 passengers) was developed from the Convair 110 demonstrator as a DC-3 replacement. 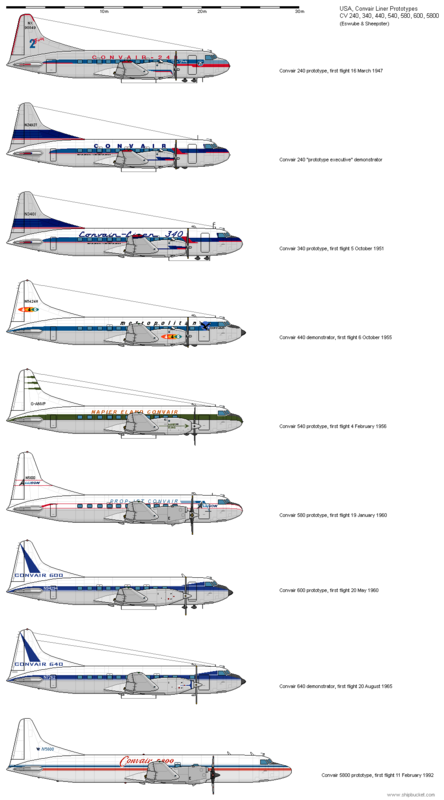 The fuselage and wings were stretched, the engines upgraded and standardised with the left-side airstair door for the 340. Further upgrades and an exhaust muffler were implemented into the Convair 440, now named the Metropolitan. Upgrade kits from Convair now make it almost impossible to recognize piston models, as upgrading engines on the 240 to 340 standard created the Convair 300, and kits to upgrade the 340 to 440 standard were popular. Forward planning by Convair had the Convair Liners engineered to be prepared for turbo-prop engine installations. The first turbo-prop airliner to fly in the US was a 240 modified with the installation of Allison turbine engines, used by Allison to provide data on the creation of a civilian turbo-prop engine. Later 2 military C-131 aircraft were again modified with the installation of Allison engines, and provided 1000 flight hours of service data on turbo-prop engine use. The first production turbo-prop Convair, the 540, was modified in the UK by Napier and then flown to the US to complete certification. Due to Convair concentrating on the 880 jet, the development was passed to Canadair who developed the aircraft into the CL-66 Cosmopolitan. Reverting to the Allison engine, the most well-known turbo-prop Convair, the 580, was developed. The 580 also featured enlarged vertical and horizontal tail surfaces. A development using Dart engines was also very successful, with the short-body 240 upgraded to become the Convair 600, and the long-body 340/440 upgraded to become the Convair 640. Kelowna Flightcraft now owns the Convair Liner type certificates and manufacturing, and has created the stretched Convair 5800 from the 340/440 series. Canadair initially produced the Convair 540 as the CL-66 Cosmopolitan, but civil interest was poor, and the Napier engine production line was shutdown. The main customer was the RCAF as the CC-109. Canadair recalled most of the aircraft and re-engined them with Allison engines, but without the tailplane modifications of the 580. I've always had a love for demonstrators and house colours. Probably the most famous Convair 300, the aircraft that was involved with the fatal crash carrying the band Lynyrd Skynyrd. Yikes! There's been some nice work on this thread! No idea if it's been done. The MOAB is the best FD aircraft added so far. That is a very subjective comment sir, as technically, the MOAB is a weapon and, not an aircraft. 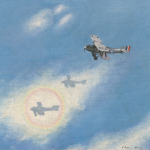 But that not withstanding and, not wishing to take anything away from Craig (who is himself an extremely competent artist), I believe that there are literally HUNDREDS of SUPERBLY drawn aircraft on here in FD scale, by many FANTASTIC artists. Can't say I'm happy with certain elements of paint schemes, but it was the best I could do. Maybe if it was done by more talented members like Darth Panda, ALVAMA or WhyMe it would look better. These 747's looks great! Can I request Cathay Pacific version? VG+PH and F1+GS are both noted for being the only two surviving examples of their types, both coming to the US on the HMS Reaper and are currently located at the National Air & Space Museum's Steven F. Udvar-Hazy Center. Since I don't believe there are any photographs of F1+GS in US markings, I substituted the 'Snafu I' which was scrapped in the 1950s.